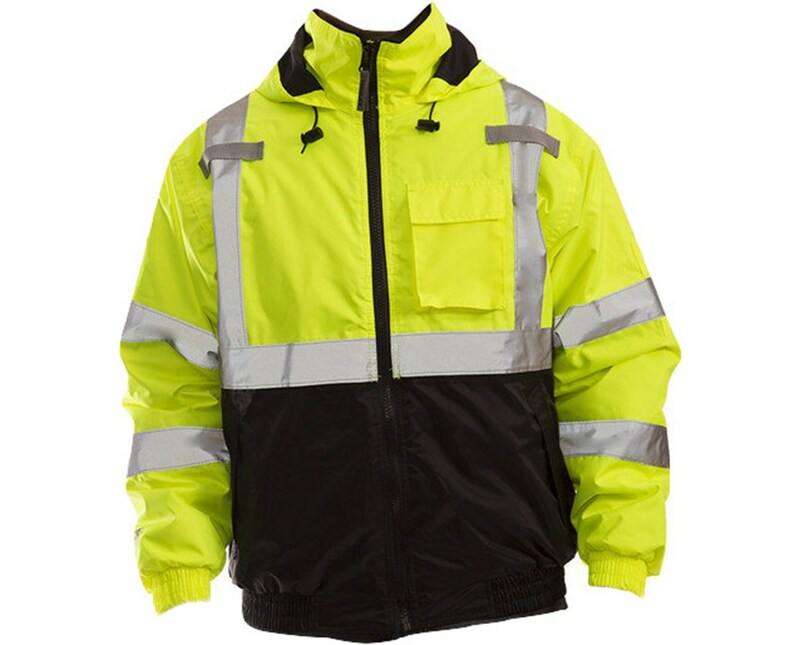 This Bomber II ANSI Compliant High Visibility Insulated Jacket is a top quality worker’s jacket that was manufactured with the consumer’s satisfaction in mind by adding special features. It has been put through testing guaranteeing its quality in regards to safety and comfort. It includes a body lining for added protection during cold weather. The quilted polyester lining on the sleeves and body of this Class 3 waterproof safety jacket will help keep you warm while you work. Composed of 210 denier polyester PU coated and a seam construction that is stitched and taped, so that together with the storm flap under front zipper the jacket will seal out wind and rain to the max. 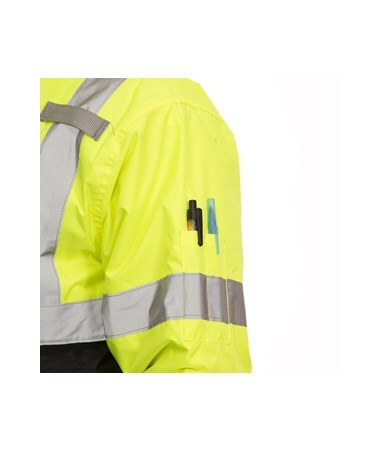 A fluorescent yellowgreen outer shell with 2” silver reflective tape along with its ANSI 107 class 3 rating of high visibility provides reflective light for 360° nighttime conspicuity and will help you be distinguished in time of danger or to vehicles when working on the road during daytime and nighttime. Manufactured with an overhead shoulder design that allows for complete freedom of movement and includes a pocket style collar with rollaway hood, an elastic rib knit waist band along with elastic rib knit sleeve-cuffs that constrict to prevent dirt from entering, as well as 2 polyester mic tabs in front below shoulders. Includes 8 Pockets in total, 1 Exterior upper left flap pocket, 2 exterior hand warming side pockets, 2 section exterior pen pockets located on the upper left sleeve, 1 interior pocket on the inside upper left of the jacket, which has a centered hook & loop patch closure, and 2 interior pockets on the inside upper right of the jacket (a cell phone pocket on top of a larger zipper closure pocket). 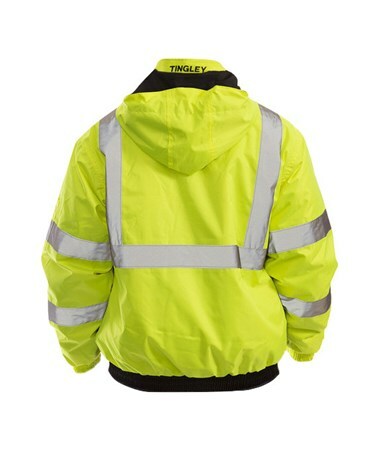 If you're looking for a high visibility jacket that provides excellent stretch, breathability and comfort, while providing safety and wind - rain protection which will allow you to work at ease, then look no further. Top quality worker’s jacket that was manufactured with the consumer’s satisfaction in mind. Added special features for multi-purpose applications. It has been put through testing guaranteeing its quality in regards to safety and comfort. 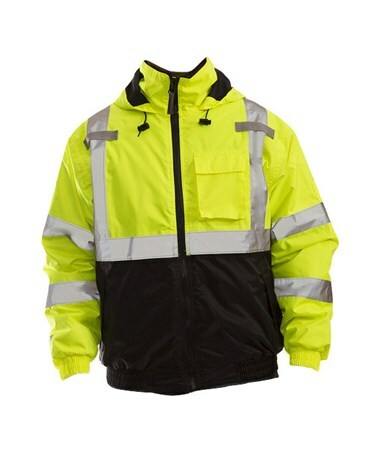 Composed of 210 denier PU coated waterproof polyester, with a seam construction - stitched and taped - 100% waterproof. Front closure has storm flap under zipper that will seal out wind and rain to the max. Jacket body is lined with black fleece and its jacket sleeves lined with quilted nylon taffeta with fiber fill, supplying a warm and comfortable insert. Fluorescent yellowgreen outer shell, with 2” silver reflective tape that will help you be distinguished in time of danger or to vehicles when working on the road during daytime and nighttime. An ANSI 107 class 3 rating for high visibility will generate a securer felling. Includes 8 Pockets including the 2 front hand warmer pockets, in addition to the 2 polyester mic tabs in front below shoulders. Manufactured with an overhead shoulder design that allows for complete freedom of movement. Contains a pocket style collar with rollaway hood, an elastic rib knit waist band along with elastic rib knit sleeve-cuffs that constrict to prevent dirt from entering.